Hello Spring - How Do You Dew? NYC-based fashion designer, Miles Ehan brilliantly uses unconventional materials such as cotton candy and cupcake wrappers to bring his signature "Cupcake Couture" designs to life. Now, Ehan is partnering with his friends at Three Custom Color Specialists, pioneers in custom-blended color, to bring the colors of his sugary sweet designs into the world of cosmetics. 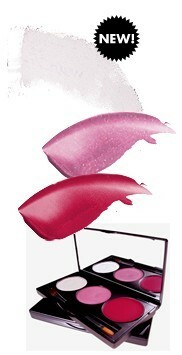 The new collection features an exciting first for Three Custom Color Specialists -- a cotton-candy flavored lip gloss! ICING ON THE CUPCAKE EYE SHADOW ($22.50): A kaleidoscope of fine, light-reflecting shimmers in gold, pink, teal, violet, and blue. Use it to brighten the inner corners of the eye, layer a sheer wash of sparkle across the entire eyelid, or dust in on the upper cheekbones as a highlighter. Apply this wet/dry shadow with a dampened brush to enhance the shimmer. CANDY CLOUD 9 LIP GLOSS ($22.50): Sheer pink with gold and silver shimmer. This gloss features a new, subtly sweet Cotton Candy flavor and fragrance! step tutorial on our blog. Designer Miles Ehan is a Houston, TX native making his mark on the New York fashion scene. Miles has studied under several design greats, including Isaac Mizrahi, Christian Siriano, Phillip Lim, and has most recently created pieces for artist Will Cotton. His design aesthetic is focused on clothes that embody and empower the woman with a chic sense of style that allows the woman to be contemporary yet classic with a twist; Miles makes most of his garments out of unconventional materials from caution tape to cupcake wrappers. For more information about Miles, visit www.milesehan.com. A kaleidoscope of fine, light-reflecting shimmers in gold, pink, teal, violet, and blue. Sheer pink with gold and silver shimmer. This gloss features a new, subtly sweet Cotton Candy flavor and fragrance! Hot rosy pink in our pro-favorite multi-tasking formula. All 3 items in a sleek, portable trio with brush! Icing on the Cupcake Eye Shadow, Candy Cloud 9 Gloss and Lollipop Lip & Cheek Stain.